You know the feeling. You have paperwork. You have sales meetings. You have a two-page to-do list that seems to get longer every day. You’re running behind. You are even late to a couple of customer appointments. It seems like you’re never actually completing your most important tasks. There’s got to be a better way for organizing your work day. There is. Time-blocking can help you schedule the time you need to get your most important work done. By selecting your most important tasks for the day, scheduling time for them, and protecting that time like you would any important appointment, you’ll find yourself more effective and less harried. Follow these six steps to use time-blocking as an effective approach to organizing your work day. Breaking down large projects into more manageable steps or tasks helps make them less daunting to tackle, says Rory J. Clark, creator of the sales performance system, Focus Selling. It also makes them easier to time-block because you can schedule shorter blocks of time that are more easily protected. If you find you’re constantly over-scheduled, track your time for a few days to get more insight into how long things actually take. Turn off your phone. Silence push notifications on email. Basically, take any action you need to eliminate distractions during your time blocks. You can’t control every interruption, but you can minimize them. Schedule your response times. Take 30 minutes twice a day to do a block of responses to texts, voicemails, and emails. Or adapt that schedule to what works for you. The goal is to protect yourself against the constant interruption of “urgent” notifications and demands that don’t really need your attention at that moment. Attention spans differ from person to person. So experiment with the length of time blocks that work best for you, says productivity coach Mike Allison. 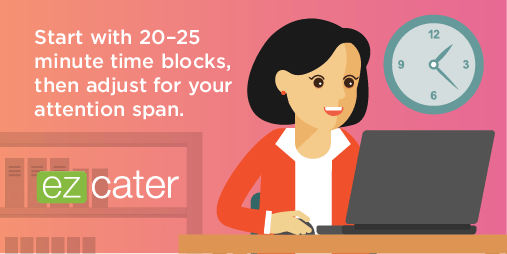 Start with 20 to 25 minute time blocks. (The Pomodoro technique productivity approach recommends setting a timer for 25 minutes and focusing on one task during that time.) But you can adjust the length of your time blocks to best suit the situation. For example, you may have client meetings where you need more time to cover complex information or thoroughly cover material to understand their needs. In those situations, schedule the time and include some breaks. 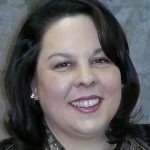 Maura Thomas, founder of RegainYourTime.com and author of Personal Productivity Secrets, recommends two hours or less in most cases, total. Your clients will be able to better focus on what you’re presenting and you can even bond over a snack or meal. When you’re organizing your work day, it’s also a good idea to take into consideration your “best” times of day to work on certain tasks. If your energy is high mid-morning, but wanes during the mid-afternoon, schedule your important task time blocks when you’re at your best. That includes staving off hunger. When you feel yourself getting hungry but don’t want to leave your desk, have some snacks on hand or order a bite to eat to help you regain your focus. Don’t create back-to-back time blocks — you need breaks in between, as Fast Company notes. Science shows that breaks actually help improve focus and productivity. Even so, most people don’t take breaks other than lunch because they feel guilty. Don’t feel guilty when you’re taking the time for yourself so you can be more focused during your time blocks. Once you have your tasks prioritized for the day, write them into your calendar. Estimate slightly more time than you think you might need for a task. Adding 15 or 20 minutes will help you feel less rushed as you travel from appointment to appointment. Organizing your work day the evening before or at the start of the day will also give you a framework to be more productive. Treat that time you’ve blocked like you would an important meeting with your boss or a sales call for a client you’ve got to win. Thomas recommends using time-blocking selectively for priority tasks, so you’re not tempted to break these appointments with yourself. However, if you do have an unavoidable disruption in your day, reevaluate your day and use time-blocking to get back on track. On busy days, ordering meals delivered to you can save time.